WU finishes but starts over again ! Message boards : Number crunching : WU finishes but starts over again ! I got some weird behavior from WUs the latest days. Message 1153 - Posted: 21 Dec 2007, 22:26:10 UTC - in response to Message 1152. See this thread for explanation. Message 1157 - Posted: 22 Dec 2007, 16:33:08 UTC - in response to Message 1153. Hm, I must say I can't find any explanation for it in that thread, just something about credits again, and it wasn't it this time, I wondered why the WUs was starting over again ??? Message 1158 - Posted: 22 Dec 2007, 16:37:04 UTC - in response to Message 1157.
as to the progress going back down to 0 then back up really quickly it seems that for whatever reason the first time the progress goes to 100 that's for the integration over the volume, and the second time is when this integral values are used to calculate the fitness over all the stars. that should be fixed in the next version and it's nothing to worry about. Message 1160 - Posted: 22 Dec 2007, 21:30:27 UTC - in response to Message 1157. The link DaveSun provided is to message Nº1095 (also quoted above), which does address the issue of progress reporting. 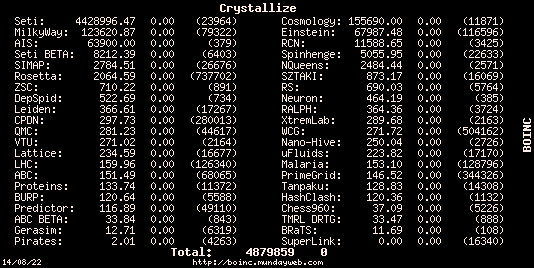 Apparently the astronomy app is telling BOINC how much of the current computation is done (it seems there’s a main one followed by a shorter one), rather than including the whole task in its estimate.